A bathroom remodel involves making many choices. One very important decision is choosing what type of finish you want for your fixtures. While polished chrome is the most popular finish, and its surface is durable and scratch resistant, brushed or polished brass fixtures provide a feel and style you may not want to overlook. The golden tone offers a look of luxury, yet the high-end appearance doesn’t have to come at a high price. In fact, brass fixtures can be priced quite reasonably. While they are typically more expensive than polished chrome, this may be a place you might prefer to shift some of your bath budget. One of the challenges with brass fixtures is that the selection may be limited. Since they are just now making a resurgence, many of the manufacturers have not created the endless styles and options that exist with a finish like polished chrome. In addition, different manufacturers may have different brasses. For example, a shower door company’s brass hardware may not match the faucet manufacturer’s brass. In some cases, this is fine but in others, we may want to consider mixing finishes. There are many ways to design a bathroom mixing metals and finishes. For example, you can mix brass bathroom fixtures, wood, and black accents, which can be present in the hardware, toilet paper holders, frames, or flooring tiles you choose. Brass is also often combined with matte black and nickel finishes for an eclectic look and feel. Sometimes people hit a wall when trying to envision what each of these fixtures will look like together. That’s where our One Week Bath Designers are essential; providing you a sample of each material and giving you a chance to see it in your own bathroom. Take the time to work with one of our Specialists who will help you through these finish decisions and your bathroom will remain stylish for many years to come. An example of beautiful brass fixtures is the Vero Collection from Delta. The collection is stylish and includes matching products including sink faucets, shower and tub sets, towel bars, robe hooks and all other accessories for the bath. This insures that finishes do match, if that’s the look you’re after. 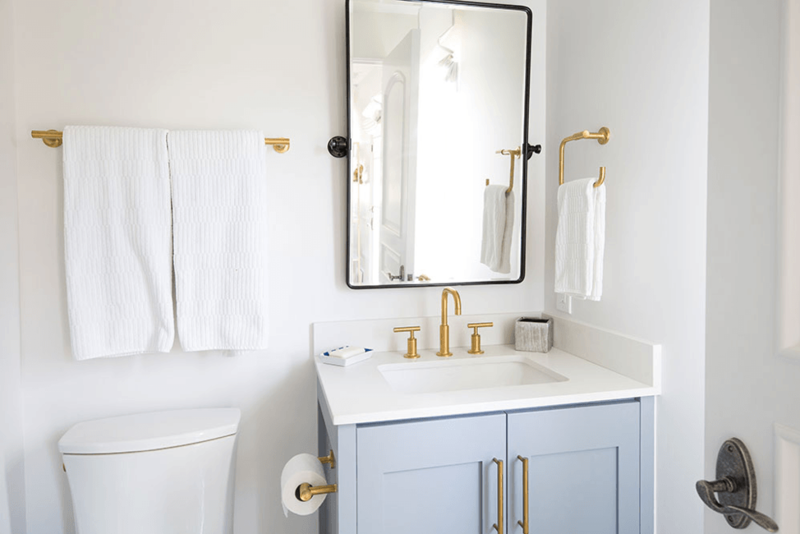 Don’t overlook brass fixtures for you bathroom remodeling project…..Brass is back! Committed to making each bathroom remodel a stress free experience, we are here to help you choose the best fixtures and materials. Our process is structured around providing you with choices, and enough of them. From an initial 30-minute phone consultation with our Designer to an in-home mobile showroom of products and design ideas, we leave no detail untouched. We ensure all your needs and expectations are met before construction begins. Plus, we guarantee a price, timeline, and our workmanship. Customers in Los Angeles, Santa Barbara, Orange County, San Diego, Ventura County, and Riverside County rely on us as the bathroom remodeling experts. If you’re considering bathroom remodeling, call 888-374-0622 or see us on line at www.oneweekbath.com and request a design consultation today.